We provide full package Moving for local and West Malaysia with professional packing and budget Storage facilities where clients can store goods at a budget rate. We have more than two decades of experience and our rates are at an affordable price guaranteed! We were featured on News Papers and have attained a few awards & certification. We have more than 10k followers on Facebook. We are Singapore's Expat favorite Mover! HDB residents, condo residents, Celebrities and Footballers, reputable people such as; Datuks and CEOs, Private sector and Public sector organisations and companies, Schools, Embassies. And our list of clientele goes on. We're known for our top-notch service with affordable price. 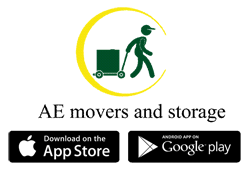 *Download our FREE App "AE Movers and storage" to make bookings at your finger tips. Your satisfaction is our reward.. Does anyone have a contact for a reasonably priced rubbish removal person that does soil removal and wood (5 old closets) ? You're asking this about a question posted 4 years ago? Why is my tick-tock meter lighting up? We are relocating to Singapore in November with a two and half year old daughter.